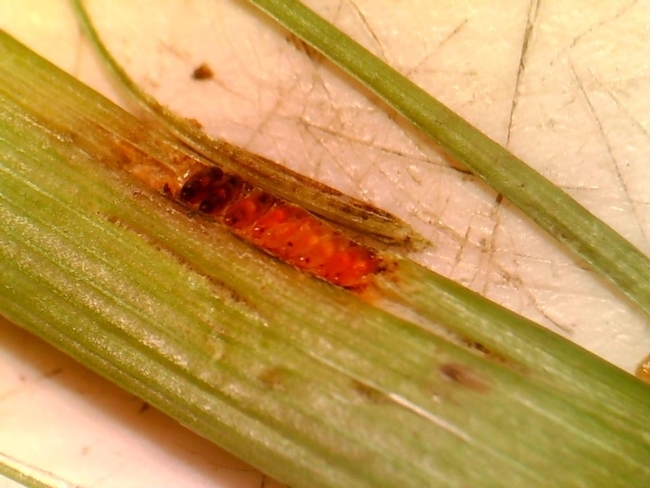 This is the first time since I moved to California that I've seen leafhoppers actually injuring rice. Leaf tips turned yellow, and from the road it looks like salt injury, but once you get in the field you can see leafhopper nymphs and adults jumping and flying around. What we have is aster leafhopper. 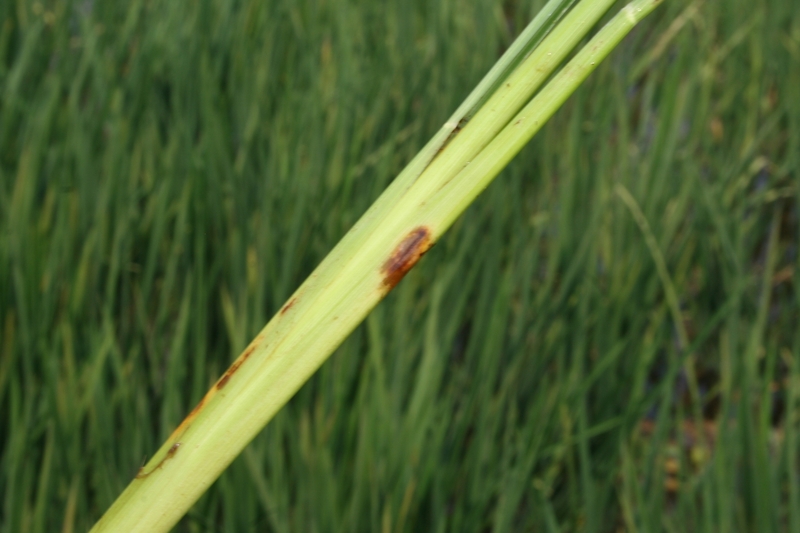 They are reported to feed on broadleaf weeds and rice. I have some research plots in this field, with some areas where rice was not planted between plots. 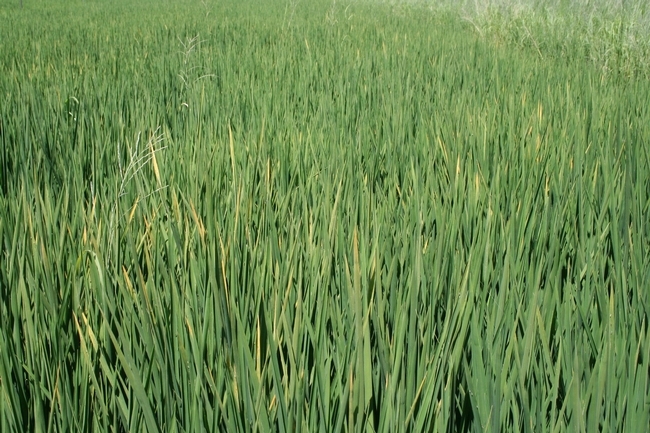 Weeds grew on the open areas, and after a propanil application that killed the weeds the leafhoppers might have moved to the rice. From the UC IPM: Rice website: "Although leafhoppers can be present in fields during most of the growing season, the heaviest populations usually occur from early July through mid-August. 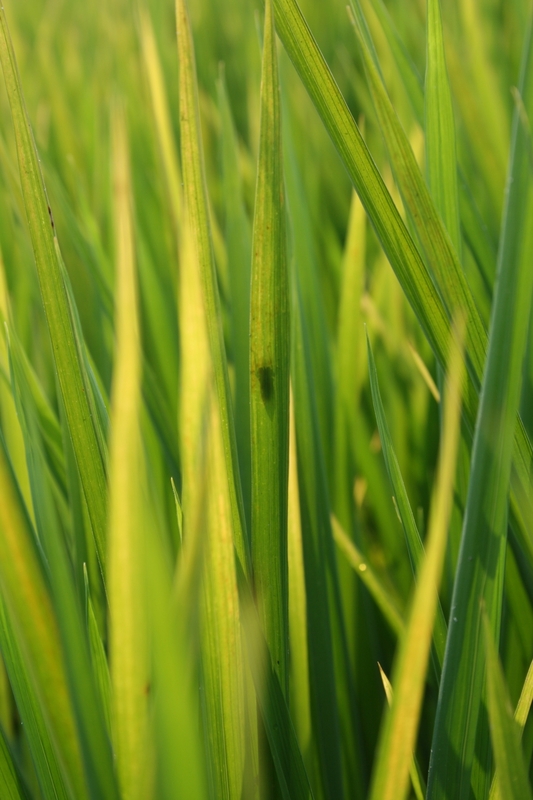 Leafhoppers feed on rice plants by sucking up plant fluids through their long, piercing mouthparts. 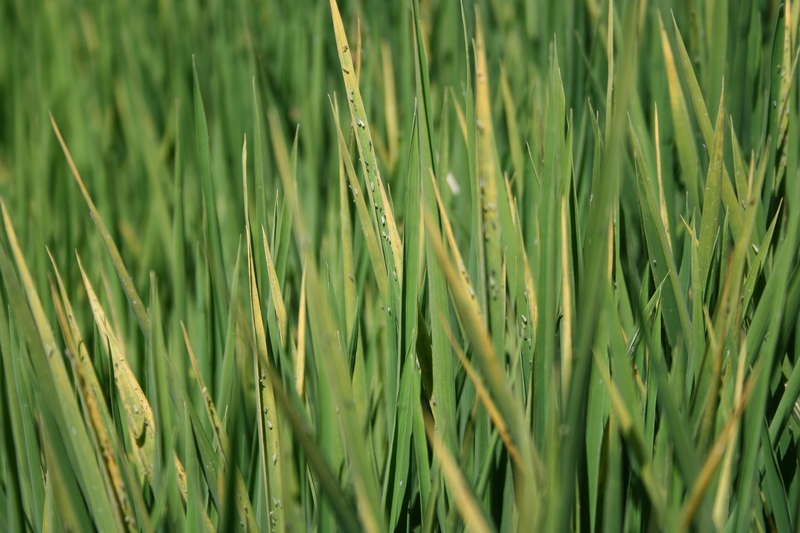 Although they are not known to vector of any rice pathogens in California, leafhoppers may occasionally occur in sufficient numbers to cause damage by their feeding. Injury associated with leafhoppers include stippling, yellowing, and drying leaves. 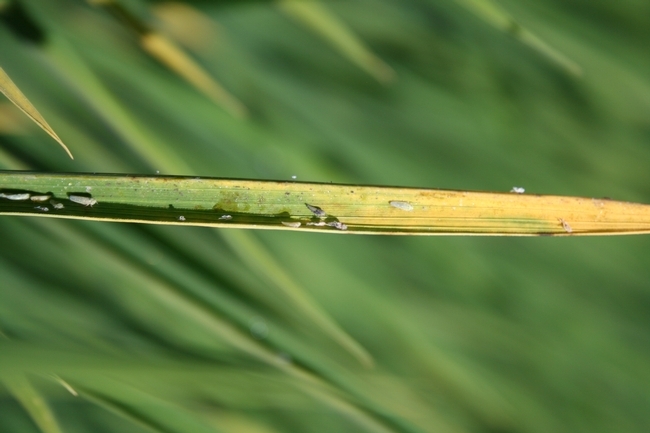 Leafhoppers prefer senescing leaves, and symptoms usually occur on older leaves first. 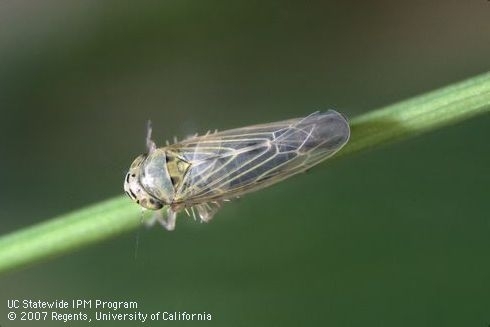 Leafhoppers are very mobile; adults fly and nymphs jump. Thus, infestations are rarely localized but appear generally throughout the field." 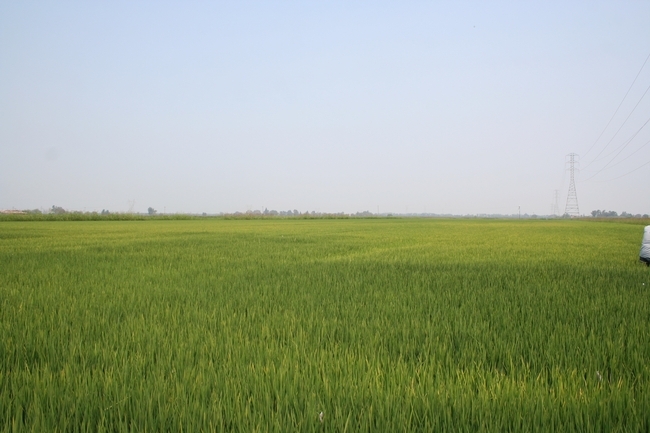 We haven't treated this field yet. 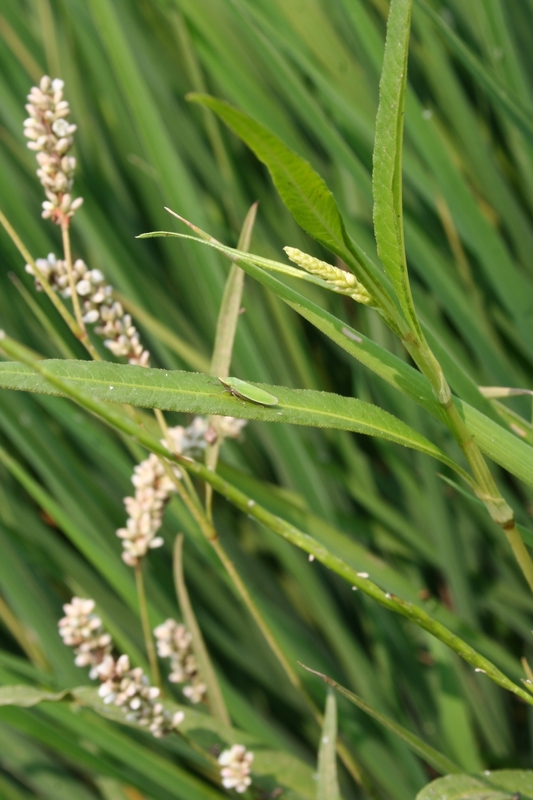 There are still plenty of leafhoppers, but the plants are growing fast and putting out new leaves. If the leafhoppers remain and start injuring the flag leaf, a treatment might be appropriate.